'EURAO land' at HAM RADIO 2013: come to visit us !!! There will be three contiguous booths, EURAO itself and its members AFCD and CISAR, delighted to welcome you at Friedrichshafen, 28-30 June, hall/stand no. : A1-563. Also other member associations will be represented inside the first one: FEDI-EA and VRA. Time to talk with members and friends about amateur radio and the future of the Organization, imagining new global projects, listening proposals, attending all visitors, etc. You know we haven't all answers, but for sure we'll listen all your questions and try to do our best to serve members. The second EURAO Meeting will be held these days, during the fair, following the biannual pattern we started at Barcelona in 2011. But most important is the Assembly that will approve the first Statutes of EURAO on Saturday 29 at lunch time, 13:00 CEST. An historic moment you can not lose. We hope you will join us for the picture. Throughout the exhibition, we will keep open a check point for those who want to achieve this Award. Remember: you need to show sufficient evidence of contacts with 10 countries, 7 of them European ones, for the basic version. With 25, 50 or 75 countries you will get bronze, silver or gold version of the same Award. So bring your QSLs with you and get this EURAO Award. The Emergency Communications National Exercise (ENCE) is an Spanish activity held together by radio amateurs and CB and PMR users in order to practice useful skills for this kind of situations. This was the forth edition, the first one nightly, and the goal was to exchange messages reliably among participants. One of these messages toured more than 2.654 Km in less than half an hour, coming from Cologne (Germany) in 20m and passing through Murcia, Barcelona and Madrid in 80m, reaching some towns in the surroundings of the capital connected by CB and 2m. CQ ENCE is organized by Federación Digital EA and Liga Española de Asociaciones CB y Radioaficionados. 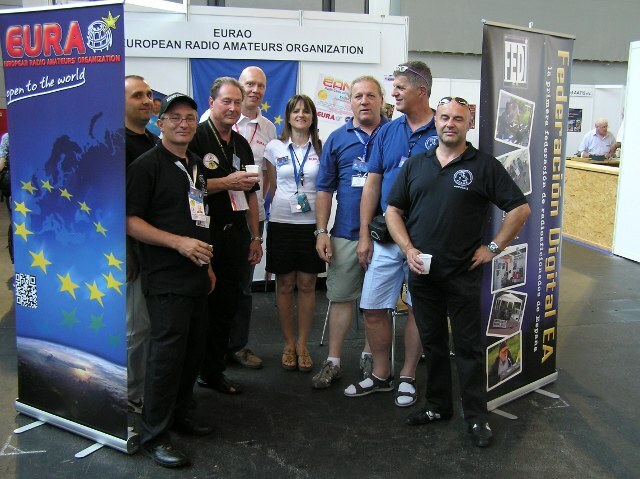 The Europe Day On The Air (EUDOTA) is a global activity to commemorate the creation of the EU and also the European Radio Amateurs' Organization (EURAO). That day you could find on the bands several special event stations (ie: AO1EU, AO2EU, AO3EU, AO4EU, AO5EU, AO6EU, AO7EU, AO8EU and AO9EU). Contacting with 3 of them you can download the basic Award. With 5, 7 or 9 QSOs you will get bronze, silver or gold Award. Also QSL cards are available via EuroBureauQSL. EURAO, where are you? 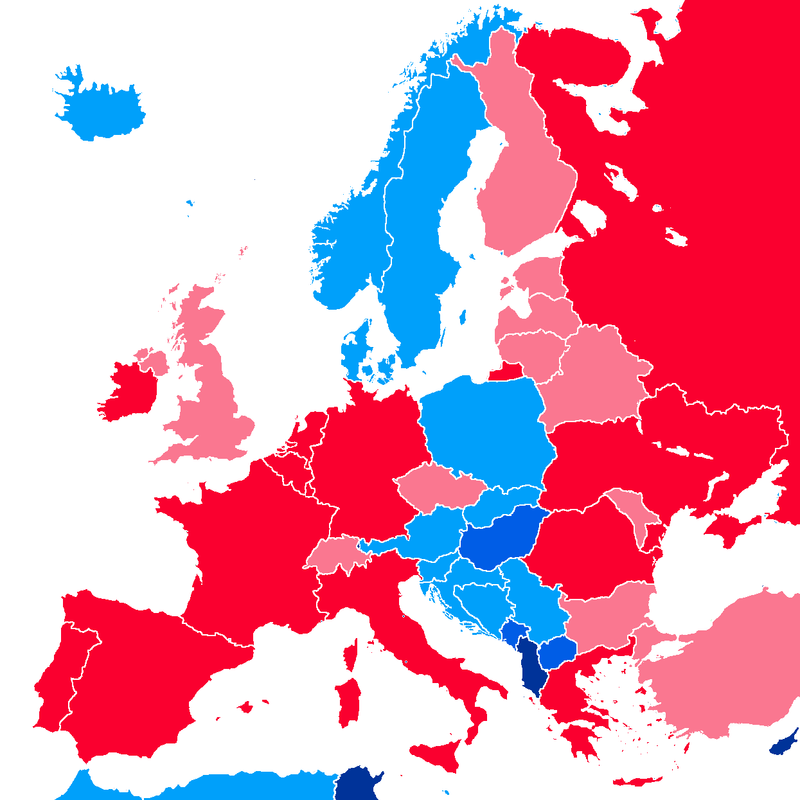 Member associa­tions (red), clubs and groups (pink), indi­vi­duals (light blue), fans (blue). A great family!